Late midyear 1974, Honda Motor Company in Japan produced 10 motorcycles that would forever change the motorcycling world as it was known at the time. For almost three years, their engineers had been hard at work in an effort to launch a design that would be far better than any other bike currently produced anywhere by anyone. The venerable GL1000 Gold Wing was the dream in design and performance at the beginning of a new era. Five of the first 10 were shipped shortly after their assembly to Las Vegas, Nevada, for the Honda Dealers Show. On Sept. 21, attending Honda dealers and their staffs placed these five bikes on pedestals for viewing the next day. Of these units, two were Candy Antares Red, two were Candy Blue Green and one was Sulfur Yellow. One each of the Red and Blue units was paired with white Hondaline fairings. The serial (frame) numbers were most likely GL1-1000002 thru GL1-1000006. Perhaps the very first unit is now housed in the Honda Museum in Japan. That accounts for six of the 10. The seventh or Serial number GL1-1000007 is now housed in a German Museum, and perhaps the three others (plus a fourth), went to Europe for the World Presentation in France and other venues. These 10 fantastic and historic units presented in the 70s were met with mixed reviews, and while a good number were impressed, to some it was a most unworthy appearing motorcycle that they had ever seen. Whether you agree or not with the look of the first Gold Wings, historians will agree that even with shaky beginnings, Honda proceeded with the introduction of the Honda GL1000 knowing it may be at worst a failure but, at best, a great machine with a fabulous future. Forty-two years later, I am OK with their decision. Looking at the record later published by Honda, the unit claimed as the first production (pre-production) frame number was GL1-1000012. If you are one of those who feel that this accounting is historically correct – what then happened to frame number GL1-1000011? We can account for the first 10 in the records but 011 is somewhat a mystery. Or is it? I believe that during the time the 10 units were busy making their debut, Honda engineers had only one choice and that was to continue the effort to get the GL1000 to the production line and as quickly as humanly possible. Now that the decision to manufacture the Gold Wing was cast in stone by Soichiro Honda, a continued but organized effort to get there was the command. My thought is that the goal at that time was to start the actual production in the late months of 1974. Given the fact that all 10 of the prototypes were assembled mid-year 1974, all but a very few were destroyed. At this writing, I am aware of only three that remain assembled – one in the Honda Museum in Japan, one in Necarsulum Museum in Germany, and one that is privately owned. The remaining seven have succumbed to history and live only in the minds of the folks at Honda and historians. 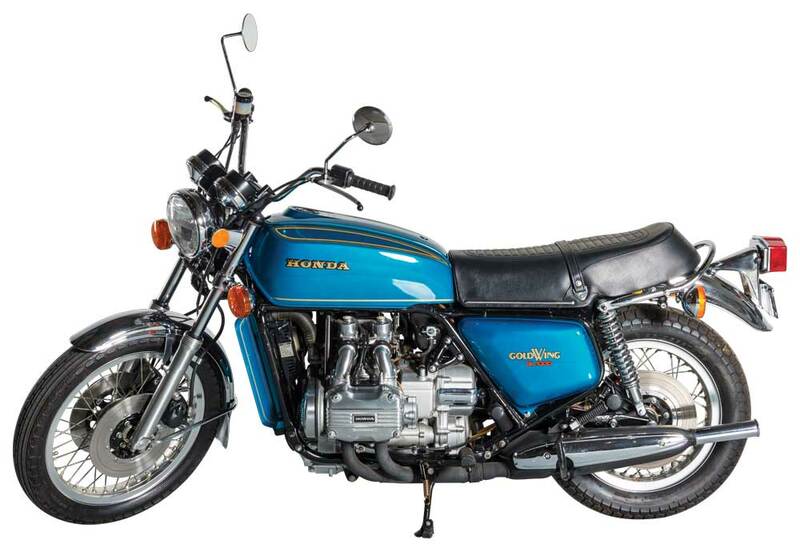 We are gratefully aware that they existed because of their early presence and pictures that were printed in the original Honda GL1000 Shop Manual HC44382, published early January 1976. Inside this book is a historical treasure trove of the early GL1000s and Honda’s attempt to get them to market. It is very apparent that the Shop Manual contained many photographs of some of the first 10 units, as well as many of the pre-production GL1000s produced in December 1974. I believe that GL1-1000011 was the first of the pre-production units and was a composite of both. In other words – it was a hybrid with the distinction of being the transitional unit from prototypical to production. It is therefore reasonable to assume that the need of the Shop Manual photographs has preserved its importance in the history of Gold Wings to follow. With the January 1976 publication of the Shop Manual, the dealers were previously given “Service Guides.” For the most part, they were hand-drawn sketches, hand-lettered specifications along with some crude pictures of the earlier Gold Wings. These instructions were reproduced at the distributor level and sent out to the individual dealers. Unit number GL1-1000011, and most likely its Engine number GL1E-1000011, had a very important role in the evolution of the Gold Wing. Even though the bike was destroyed, it continues to live on inside the pages of HC 44382 Shop Manual. Posted 06/21/2017 by WingWorld & filed under Tech.